The Michael Collins Foundation and the Fellowship of Christian Athletes announce the 2018 MCstrong Golf Outing. 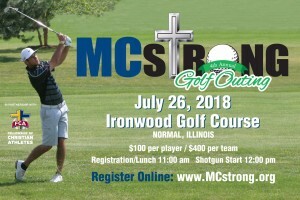 This year’s event will be held on July 26th at Ironwood Golf Course in Normal Illinois. You may either Register a team online here or Print Registration Form and mail to The Michael Collins Foundation PO Box 19 Hudson Il 61748. Thank you for your support of Michael’s foundation and the Fellowship of Christian Athletes!